The railway track we use for velorails is part of the SNCF rail system and may one day be put back into service. Rail bikes rides begin at the railroad station at Pont-sous-Gallardon, and travel the rails back to Chartres to Coltainville. The line was known as Paris-Chartres via Gallardon. Leaving the station at Pont-sous-Gallardon, you will cross the grade separation of the former single track line to Maintenon, Nogent- le-Roi and Dreux. The track, bordered by trees, rises gradually from the valley of the Voise to the plateau. The track passes close to the glider airfield of Bailleau-Armenonville with a good view of the buildings and activities. On the open plain of the Beauce you glide along gently to the two platforms of the Senainville station. Chartres Cathedral is visible between a border of hedges, the rails seem to point directly to the towers of the cathedral. 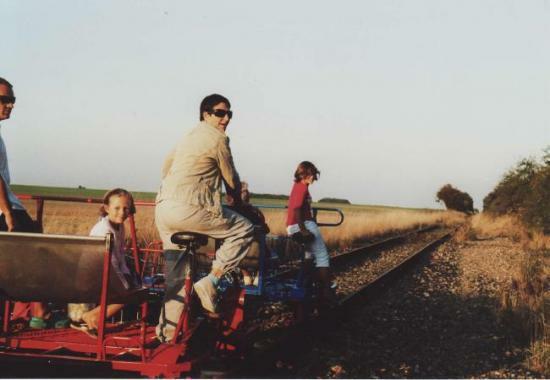 In the beautiful open wheat fields, you turn your rail bike around for the return journey. The outward journey is a steady, gradual incline that you can feel in your legs. You will be rewarded with an effortless return journey for a total ride of 13 km. Because there is only a single track, all the velorails must leave at the same appointed time. At the turn around point the rail bike are easily turned on the track. When the last rail bike has been turned, they all depart for the return journey. It is advisable to telephone for reservations: 09.54.40.00.00. You must arrive 15 minutes prior to departure for a safety briefing or your reservation will be cancelled. During winter we are closed, but we open again the activity on saturday from march 31 st to sunday november 4 th 2018. However, you can phone to book a travel in this period.